If a dime had been dropped into the U.S. Treasury every time the word “change” was uttered during the presidential campaign, we might all have a little jingle in our pockets. That would certainly be welcome news for the half-million American workers directed to the unemployment line last month. Current headlines are all about U.S. automakers hoping to nab billions in government loans to help them shore up their flagging industry and avoid laying off hundreds of thousands of workers. This on the heels of a $700 billion bailout of the U.S. financial markets. Now, Jobs for Justice, a national organization dedicated to workers’ rights and standard of living, is calling for a “people’s bailout.” The group is staging a weeklong series of events around the country, including in Vermont. Here, the rallying cry will be heard at the all-day Ella Baker Human Rights Conference on Saturday, December 13, at the University of Vermont’s Davis Center. The event is co-organized by the Vermont Workers’ Center. There are four basic proposals in the people’s bailout, Stanger explained: an immediate multibillion-dollar investment aimed at helping working people; passage of the Employees’ Free Choice Act, which would make union votes public rather than secret; an immediate stop to foreclosures to keep people in their homes; and an emergency action to keep people from losing their health care. One of the Burlington conference’s keynote speakers will be U.S. Sen. Bernie Sanders, who is advocating for an economic stimulus package of at least $500 billion — largely targeted to get people working on the country’s infrastructure and alternative energy projects. In tough times, even the mighty labor unions are making concessions. The United Auto Workers reduced the amount of money and benefits the Big Three automakers have to pay to retirees and other employees who have left the active workforce. Such sacrifices may be on the table next year in Burlington, too, as nearly a dozen unions large and small will see their contracts expire. Workers from each of those unions are beginning to talk to each other, and to interested community members, in hopes of rallying support. Bargaining talks are expected to be rough, and major gains unlikely, said Chris Guros, a union leader at the HowardCenter. His union’s contract is one of those up for renegotiation. At Saturday’s event, Guros will lead a workshop on bargaining during tough economic times or in hostile environments. It all boils down to getting the community behind you, he noted. And that, increasingly, is the aim of the Vermont Workers’ Center. VWC Director James Haslam said his group has been broadening its mission in recent years to help non-union workers and residents organize in their communities around key concerns: schools, housing and health care. In the Queen City, these efforts are collectively carried out by the Burlington Livable Cities Coalition. One example: Two years ago, the Burlington School District targeted an elementary school for closure in the Old North End. 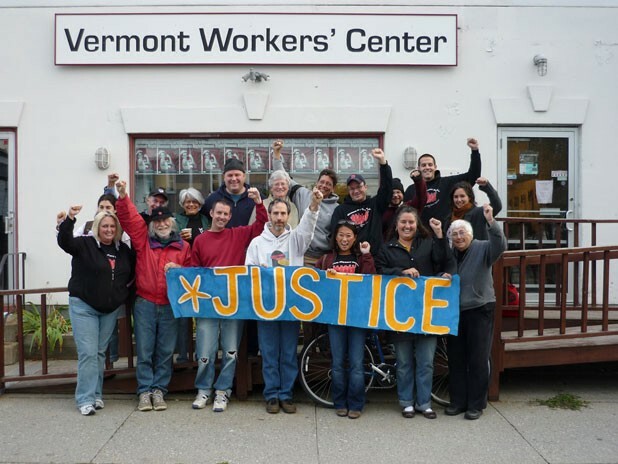 The VWC worked with residents, some of them union members at UVM and other local employers, to fight back. In the end, residents won. Guros said VWC would not accomplish much if it didn’t address these key local concerns, given that its mission is to help the disaffected gain strength in numbers. The organization’s current lead-paint campaign is a perfect example. As part of its Healthy Homes Initiative, the VWC is working with tenants and parents in Burlington’s Old North End to update the city’s lead laws. The aim is to increase enforcement of existing rules, and to add another one: If a child age 6 or younger is in a rental unit, any lead in the building should be abated. To manage its additional tasks, the VWC has grown — funded by member unions. Last May, Haslam was the sole staffer; since then, two full-time organizers have been hired — one focused on the health-care campaign and the other on the livable-cities coalition. Two new part-time AmeriCorps workers came on board last month. Despite its new tasks, though, the VWC remains dedicated to helping workers organize unions, and to supporting existing unions during contract negotiations. Denise Foote, an outreach worker at Barnes Elementary, recently joined VWC’s health-care campaign after taking part in the Healthy Homes Initiative. “They are focusing on issues that are not limited to class,” she said of the organization, “issues without boundaries — everyone can be affected by lead poisoning or a lack of health care . . . The education they do on these issues is almost as important as the organizing,” added Foote. The Ella Baker Human Rights Conference is Saturday, December 13, at the UVM Davis Center in Burlington from 9 a.m. to 3 p.m. The event is free and open to the public.